My son is very excited and can’t wait. 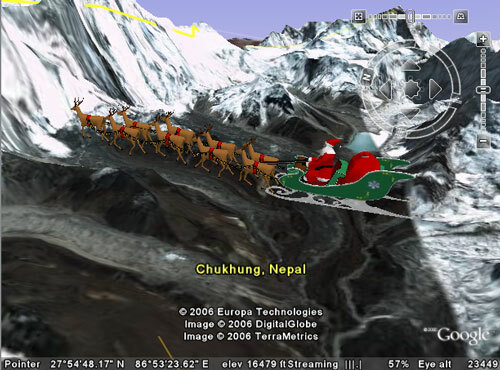 We’ve been tracking Santa all morning. One of my young nephews asked why Santa’s workshop isn’t at the North Pole. I was surprised by the question and asked how he knew that. He said his Dad had been showing him the GE Santa KML stuff and Santa’s workshop is in Canada. I was thinking about explaining that users have great difficulty navigating at the poles and that Google had to move it so that people could see it. That seemed a little too much for him so I fell back on there are no islands at the north pole. Unlike the South Pole, the North Pole is just water. So Santa lives on an island as close to the North Pole as possible. He seemed to buy that…. Connor and I are tracking Santa on the internet and all I had growing up was visits to Santa’s Village. Oh well, Merry Christmas!